Though hospital chaplaincy may not immediately come to mind when we consider the many ministries of our Church, for those who are ill and in need, along with their families, a hospital chaplain provides tremendous support and comfort. Such was the case for the anonymous donor who established The Catholic Chaplaincy Endowment for MedStar Franklin Square Medical Center. Recalling the establishment of the fund, Reverend Monsignor Robert Hartnett, Pastor of Our Lady of Mt. Carmel in Middle River, said, “This person came to me and said they wanted to make a significant donation. We talked about several possibilities, but one of the things the person talked about was a loved one being in the hospital and getting a visit from Father Patrick Besel. This person was so appreciative.” Father Besel, Associate Pastor of Our Lady of Mt. Carmel, serves as the Catholic Chaplain at MedStar Franklin Square among his many duties at the parish. Though the largest religious denomination represented at the hospital is Roman Catholic, the hospital does not financially support the presence of a Catholic chaplain there, and support for one has traditionally come from the 10 parishes surrounding the hospital. Monsignor Hartnett had long thought something should be done on a more permanent basis to ensure the presence of a Catholic chaplain. Once this was explained to the anonymous donor, it became clear that this issue was one he or she most wanted to see addressed – to help make sure there would always be a chaplain to help Catholics in need at MedStar Franklin Square. When Father Besel describes his ministry at the hospital, its significance becomes evident. “When people are very sick or at the end of life, it often brings up all kinds of questions and a lot of fears. To be able to walk with them in that journey of really growing closer to the Lord is important,” he said. 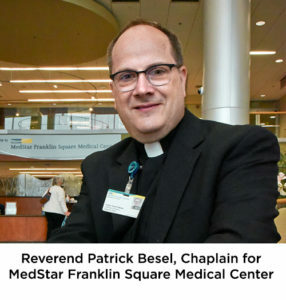 The Catholic Community Foundation is very grateful for this anonymous donor’s generosity, which will help ensure the efforts of Father Besel and future chaplains at MedStar Franklin Square Medical Center will endure for years to come.